Stalled contract negotiations between California State University (CSU) administration and the CSU Faculty Union (CFU) have led to picketing across California campuses including a demonstration at Cal Poly on Jan. 16 throughout January. The union's main grievance stems from a disagreement over how a raise would be implemented. 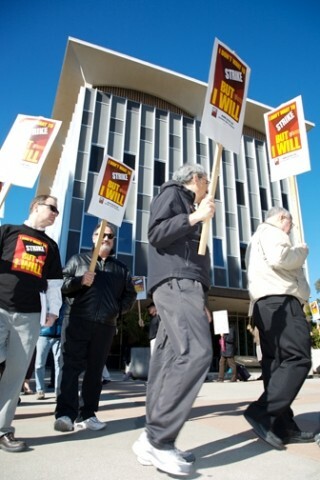 SIGNS OF THE TIMES : Faculty members picketed the administration building at Cal Poly on Jan. 16. The event was part of a statewide move by the California State University Faculty Union throughout January to raise awareness of a bargaining impasse in contract negotiations with CSU administrators. # The two sides have officially been at an impasse since December 2006, when CFU President John Travis says the CSU negotiators "left the table." Negotiations over this contract have been in the works since March of 2005 and should have gone into effect last June. The CSU calls the contract more than fair, but the faculty union wants to review the fine print. There's little dispute over the complaint that CSU faculty salaries aren't competitive when compared to salaries earned by faculty members at similar universities in other states. A representative from Cal Poly was unable to comment on either the negotiations or the picket, because they're an issue with the CSU system, not the campus. Clara Potes-Fellow, a CSU spokesperson, believes that the picketing has had a negative impact on campuses, and that it reflects poorly on the faculty. "Conditions for faculty are not as bad as they portray," she said. CSU Spokesman Paul Browning said that his organization was surprised when the CFU didn't accept the initial offer 18 months ago. "We always want to get the faculty what they deserve," he said. "They should be on par with other universities." The union's Travis, however, believes that the salary issue is actually more a matter of priorities among the administration and trustees. He sees "general problems with the way money is being spent" a sentiment echoed by other members of the faculty union. The union maintains that the current contract on the table, which promises a 24-percent salary increase over the next four years, plus health and benefits compensation, is actually closer to a 14-percent increase when you look closely at the language. The disputed 10 percent comes from three different areas, the faculty union alleges. Three percent is in the form of merit pay that's given in full, in part, or not at all to faculty based on managers' discretion so it's not guaranteed, and would not affect the entire staff, said Alice Sunshine, a spokesperson for the faculty union. Three percent comes from a general salary increase from Gov. Arnold Schwarzenegger which he failed to approve in the 2007 budget presented on Jan. 10. The remaining four percent could disappear, Sunshine said, because in order to receive that portion of the raise, the faculty would have to give up step increases periodic raises given to faculty members as they move up the pay ladder. Without such step increases, junior faculty members stand to make less money than teachers hired after them. CSU spokesperson Potes-Fellow explained that the CSU's offer is a 24-percent general salary increase for everyone and that the faculty union has the option to delegate a portion of that to step increases and merit pay. Potes-Fellow said that, by breaking down the 24 percent, "some [of the faculty] would get 14 percent, some would get more, and some would be eligible for more." As for the three percent from the governor, Potes-Fellow said that it's not part of the promised 24 percent, but that the CSU will continue working with the legislature to secure it in the budget and for the next three years. Since the faculty and administration have failed to come to an agreement, the next and final step in the resolution process is to appoint a three-person fact-finding committee to independently investigate any contract issues that continue to be in dispute. The CSU and union would each appoint their own fact finder, and would together agree on another. There are no time restrictions for the fact-finding stage, however representatives from both organizations appear eager to find a resolution quickly. Once that phase is complete, administrators and the union will have 10 days to assess the findings confidentially and come up with a new offer based on the information presented. If the parties fail to agree at that point, the report would become public and the CSU would resort to its last, best offer, according to Browning. At that juncture, if it should come, the faculty would have a legal right to accept, decline, or vote to strike. The investigation process is expected to take no more than a month, and should be presented in April, Browning said. This is not the first time the two organizations have had to bring their case to a fact-finding committee. In 2000, the last time the contracts were discussed, negotiations came to a halt over the inclusion of merit pay as part of the total salary increase.